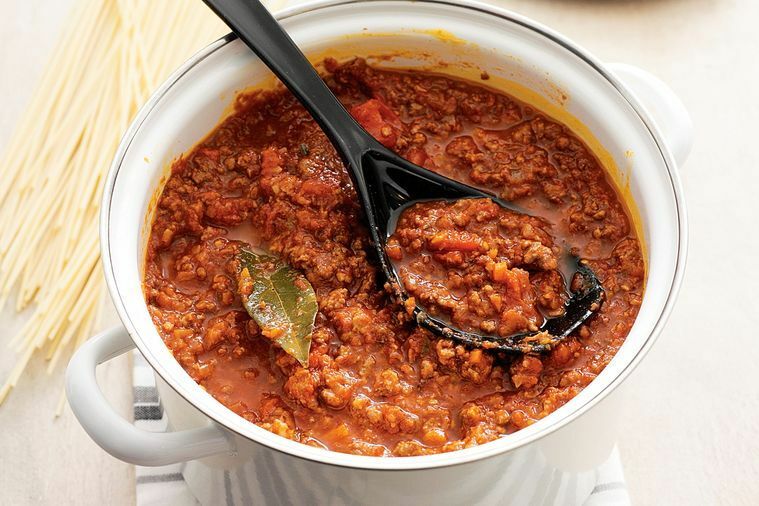 This bolognese sauce is my new addiction. My friend Corinne made dinner for the kids and I last week saying “We’re just having bolognese, I’ll bring some over.” But there’s nothing “just” or ho-hum about this bolognese, which is hinted at by its somewhat random ingredients list, and twice cooked methodology. But man, is it worth it. Corinne’s bolognese is hands down the best I’ve ever tasted. I think perhaps she was well aware of our family’s penchant for Weetbix and porridge dinners, especially when dad’s away. But we so appreciated her kindness in sharing with us some of what she and her family were having for dinner that night, which just so happened to be amazingness masquerading as ordinary. To me, this best ever bolognese is called Bacony Kindness Bolognese, and I thank God for my friend and for hers. First published by Delicious Magazine, (photo credit too) this lovely gluten free and freezer friendly recipe costs under $20 to make and easily serves 10. Melt the butter and olive oil in a large flameproof casserole over medium heat. Add the chopped bacon and cook, stirring, for 3-4 minutes until it starts to crisp. Add the onion, celery, carrot and garlic and cook, stirring, for 5 minutes or until softened. Add the beef and pork mince and cook for 8-10 minutes, breaking the meat up with a wooden spoon, until browned. Add the milk and nutmeg and simmer over medium heat for 4-5 minutes until the milk evaporates. Add the tomato paste and stir for 2-3 minutes until combined, then add the wine and allow to simmer for 10 minutes. Add canned tomatoes, stock and herbs. Season with salt and pepper. Cover, then cook in the oven for 2 hours or until thickened and reduced. Skim any fat from the surface, then serve with pasta. Thanks to you and Corinne for this interesting recipe. I cannot wait to try it!